Further, in much of present-day society our sense of self-worth is heavily bound up in how much money we make, and what we can afford to buy and own. What sort of a house (or apartment) do we live in? Do we own it or rent it? What kind of car do we drive? How nice are the clothes we wear? We even speak of our “net worth,” which is the dollar value of everything we own minus the dollar value of everything we owe. How much are you worth? Can it be counted in dollars? And more fundamentally, do any of us really own anything? Of course, legally we can and do own things. The law says that if I hold title to a piece of property, then I own it, and I can generally do with it what I wish. If I decide to sell it, the money is mine, and I can use it to buy something else, which I will then own. So in one sense, it’s obvious that we can own things. And yet, human laws are simply an agreement among people that we are going to treat certain things in certain ways. 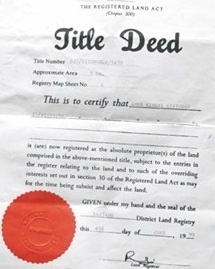 Human beings in various nations have written laws saying that if I hold a particular officially recognized piece of paper, and it is registered with the county or state, this gives me an exclusive right to use and benefit from the property or other items described on the piece of paper. And since almost everyone in society agrees to abide by the laws giving me that right, we all maintain together the persuasion that I own this or that piece of property. We all agree on it, therefore it must be true. As long as we do broadly agree on this system, it provides a reasonable framework for sorting things out among ourselves and avoiding conflicts. Property ownership law is not necessarily a bad thing. However, it is good to keep in mind that this system of possessions and property ownership is not an ultimate reality of the universe, nor is it a God-given right. It is simply a system that we humans, in many nations around the world, have developed and agreed upon for our own purposes in creating a reasonably orderly and peaceful human society here on earth. In an ultimate sense, we don’t really own anything. We simply have a limited level of outward control over certain things that we call our own, and that others agree are ours. That control is tenuous at best. If our employment situation changes, or the laws change, or disaster strikes, or we die or become incapacitated, our sense of ownership can be wiped out very quickly. We can suddenly have little or nothing that we can call our own. Things pass into our hands, things pass out of our hands, and our control over it all is more limited than we like to think. Ownership is a fleeting thing. In earlier ages, when legal systems weren’t so well developed and human society was simpler than it is today, the sense of personal ownership was not such a central aspect of society—and this is still true in some cultures today. In Old Testament times, when the Israelites moved into and conquered the Holy Land, although it was sometimes referred to as a “possession,” it was also carefully pointed out that the land was an “inheritance”—in other words, a gift—from the God of Israel. The land itself could not be sold because the people did not actually own it. Only the use of the land could be sold for a certain period of time. Every fifty years, in the year of Jubilee, any land that had been “sold” was to revert back to the original clan whose inheritance it was. This brings us to the reality of the situation, beyond all human laws, agreements, and commonly held myths and fictions. The fact is, none of the land and nothing else we possess is really ours. Not even our own body is really ours. It is all God’s. God made the entire universe and everything in it—including us. Among ourselves we agree that we own things for a shorter or longer time, and we agree (or should agree) that we each have control over our own body. But in reality God owns everything, rules everything, and even keeps everything in existence moment by moment, from eternity to eternity. We don’t own anything. Everything we have is a gift from God. And it is not the sort of gift that God gives to us and then it becomes ours to hold onto. It is the sort of gift that God is continually giving us. It is like water running out of a faucet. If the flow were cut off at the source, it would run through our fingers and be gone. We think material things are so solid, so permanent, so real. We can touch them and hold onto them. They are solid, stable, dependable. And yet, all of these seemingly solid things around us are made of trillions upon trillions of tiny little atoms that have practically no substance to them. They are made of infinitesimally small particles—or perhaps just waves—zipping around in a vast amount of empty space and creating force fields that we feel as solid matter. If the energy powering them were taken away, if their motion were stopped, they would instantly collapse into nothing, and that seemingly solid chair that you are sitting on would simply vanish. The energy behind them is God’s love. The reason your chair, and the electronic device on which you are reading this, are not vanishing right now is that God wants them to be there, and is continually creating and sustaining them for you. They do not keep on existing because matter is permanent. Matter is not permanent. It is evanescent and fleeting, made of energy and empty space. Your chair and your computer or tablet or smart phone are still there because God wants them to be. The building you are in, and the grass and flowers and streets and buildings outside, the sky and earth, the sun and stars, and everything else in this world has a sense of permanence about it because God’s will is permanent and eternal, and God continually creates for us everything in the world around us as a pure gift of love. And here we are, thinking that we own things. That they are ours. The sooner we realize that we that we own nothing; that we are nothing on our own; that everything we have and everything we are is a pure gift of God, given to us continually, moment by moment, out of pure, compassionate, infinite, eternal divine love, the sooner we will see our real place in this universe—and the sooner we will gain the happiness, joy, and deep inner peace that God wishes to give us now and forever. No matter what human law and custom may say we own, and no matter what we may think is “ours,” we are all the recipients of fantastic, incredible gifts from God. Forget the house and the car—as nice and necessary as they may be. Take a look at the world around you. Take a look at the trees, the flowers, the sky, the clouds, the sun, moon, and stars, the wonders of a single tiny insect flying by, and of the entire vast universe as far as our most powerful telescopes can reach. All of it is a gift to us from God. Consider our own bodies, so incredibly intricate and complex that even our most advanced science has barely begun to understand how it all works. We walk around in our body all day, and rarely stop to think that we are a walking, talking miracle. Each one of us is a miracle of human form and function designed by a loving God. Our own bodies are an incredible gift from God. And then there are all the people around us. Just look around in your neighborhood or your town. People of all ages. Babies, children, teenagers, adults, elders. Every one of them is also a miracle. And we have been given to each other through the love and grace of God. Consider your family and friends. Perhaps you don’t always get along with them. But every family member and friend is a miracle given to us by God. The same goes for everyone in our community. Then consider that there are billions of these human miracles living on this earth. And every one of them is unique—different from every other. Yes, the entire world of nature and the entire world of human society has been given to us as a huge, incredible gift from the vast, inexhaustible love of God. None of it is our own. Yet all of it is given to us to enjoy, to learn from, to share with, to grow into. Everything around us, both what we think of as good and what we think of as bad, is God’s free gift, given to us for our pleasure and enjoyment, yes, but also for our learning and growth. And if we will only appreciate it and use it well, it is given to us for our eternal happiness and peace. This is what Thanksgiving is all about. It is about recognizing all of our wonderful gifts, all of our wonderful blessings from God, and being thankful for them. No matter what we have suffered and what we have lost, we have all been given far more than we have ever given in return. Even the beloved people and belongings that we have lost were gifts from God—and the more precious the gift, the harder its loss. Yet these dear loved ones and these treasured possessions have enriched our lives, and continue to enrich our lives as we hold them in our memory. We have all received one blessing after another, whether or not we recognize and appreciate it. And God does ask something in return. Just as God has given everything to us, we are to give everything to one another. Wealth and poverty may be important to us here on earth, but they mean nothing in the eternal scheme of things. It is what we do with what we have—whether it is much or little—that will stay with us eternally. And true wealth is not the wealth of the world, but wealth of the spirit. True wealth is the spiritual gold and silver of love and understanding, of joy and inner peace. We have freely received a wondrous wealth of gifts from God, material and spiritual, human and divine. What God asks in return is that we give ourselves as a living gift of love and service, of help and support, to one another. God asks us to give to others the same generosity of love, understanding, and kindness that God has so richly given to us as an eternal blessing. A good post for Thanksgiving, thank you. Regarding other spiritual matters, I found reading religious/spiritual quotes from Einstein to be humbling and enlightening. You may too. You are very welcome. Glad you enjoyed it. And yes, Einstein’s mind went beyond physics to offer some great spiritual insights as well. Thanks for your beautiful words! I’m glad to have stirred up some new inspiration for you.